The slaying of gladiators was regarded as a normal form of entertainment in ancient Rome. They were slaves with masters who fed and trained them well and attended to them medically. There were among them prisoners, debtors, prostitutes and criminals condemned to death, but also free men who volunteered to take the oath “to be burned, to be bound, to be beaten and to be killed by the sword.” There were those who were skillful enough to live to retire as free men, but most died before the age of thirty. Some men became famous and had an extensive following, as do athletes, attaining the status of hero in their culture’s eyes. The victor’s wreath of laurel leaves was the special distinction of an exceptional gladiator. Allen here depicts one of those gladiators, a handsome, virile, smart, strong fighter who has won the victor’s crown! He wears a garment tied at one shoulder and holds his head confidently on a muscular neck so developed that it is almost as broad as his skull. 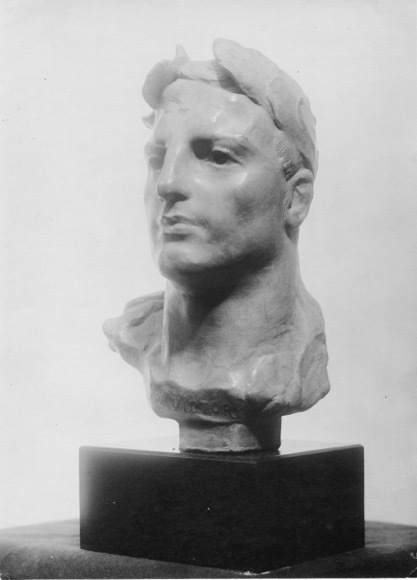 The square jaw and high cheekbones form strong structural angles at the sides while a cleft chin, shapely lips and high-bridged nose give detail to the line marking the center of the face. The stress and determination of the young man’s performance shows in the furrowed and scarred brow, but the eyes are quiet with an inner strength. The head is smaller than life size facing forward and erect on the spine. The crown of the skull is slightly narrower in depth and width than the bones of the jaw and the neck is wide when seen from both side and front views. The ears lay flat against the sides of the head and the profile shows a clear diagonal line from the top of the forehead to the tip of the masculine nose. The prominent frontal eminences and superior temporal lines of the forehead’s skull bone clearly illustrate the sculptor’s knowledge of anatomy. The laurel leaves of the victor’s crown protrude forward and upward like wings between which the hair is combed forward to the brow. A suggestion of the leaves continue around the sides of the head ending in a flat knot tied at the occiput. The left shoulder is cut at the neck whereas the right shoulder is prominent, like another wing shape, with some detail to the knot of fabric. The strength of the center column of the portrait keeps the off-center shoulder in balance while the asymmetry adds interest and flair. Gladiator Victor plaster cast, 1916 by F.W.Allen, Sculptor. Side view shows his strength. Very classical in style like the statues of antiquity, the Gladiator Victor is a fine example of the Beaux Arts training Allen received from Pratt and his time in the Paris Academies and museums. Crown Symbol : A victor that has proved his preeminence by the performance of a great feat, and in doing so, won strong public recognition, is worthy of the crown. The crown sits upon the head, at the highest point of the body, and this is significant; it is a clearly visible statement of superiority that separates the victor from the multitude. This separation, subsequently, creates an expectation that the victor is worthy of esteem; and this, in turn, endows him with the obligations and demands of leadership. Posthumous copy in bronze, brown patina. 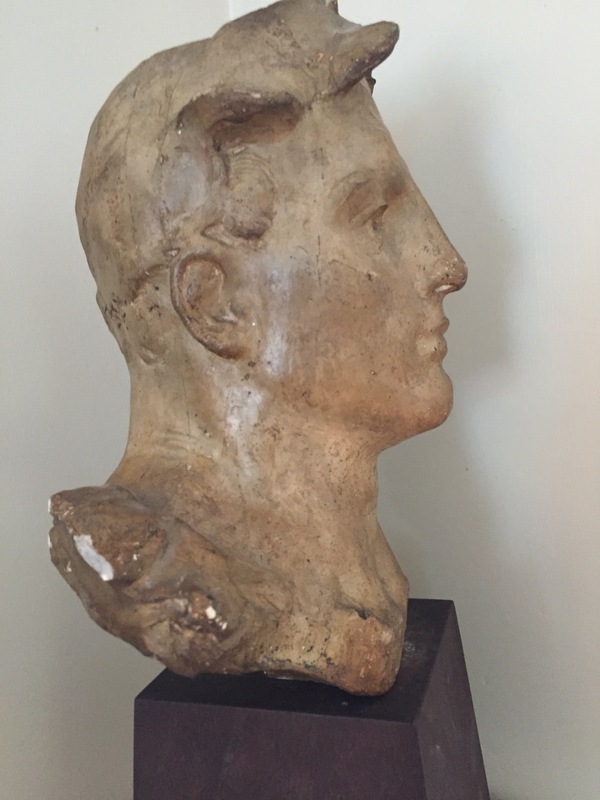 Clay original, plaster and bronze casts, posthumous bronze cast from plaster, original photo had “stem” under neck, plaster cast had no stem, bronze posthumous copy from plaster cast has wooden “stem” added to secure it to new trapezoidal base. Rectangular dark base in original photo presumed to be marble; plaster cast, beige patina darkened with age and handling, dark walnut base of trapezoid shape. Signature, Inscriptions and Date: Plaster cast unsigned and undated, VICTOR at the base in raised block letters under the neck and GLADIATOR to the left of it in the curve of the shoulder in the same size and style lettering. On the cut bare plaster underside of the base is written in pencil by Merrilyn Delano Marsh “FREDERICK W. ALLEN MY TEACHER” Date established by published records. Provenance and current location: Location of bronze and original cast unknown. Second shorter cast was owned by Elizabeth MacLean Smith who gave it to Merrilyn Delano Marsh who gave it to Christina Abbott 6/15/15.